writings — perhaps, while giddily inspired by the bottled bounty of its vineyards! in an equivalent winemaking manner called méthode traditionnelle. not having bought more before having to wait again until next October! This wine’s straw-yellow colour, apricot and pear aromas, some nutty and baked brioche notes, and a lively mousse make for a refreshing counterpoint to unseasonably warm weather and the possibility of a few more ‘al fresco’ meals! Try as an apéritif or with lighter fare such as fresh salads, goat cheese tartlets, pâté and seasoned crisps or alongside moderately spicy Asian appetizers. Washingtonians do well: side-step generalized preconception while continuing to build on the economic foundation of forestry and shipping established in the 19th-century, which then diversified into commercially-scaled agriculture in the 20th-century; becoming the USA’s foremost producer of apples, along with major crops of cherries, raspberries, pears, wheat, hops, and now – grapevines! planted on the same 44 thru 47th latitudes as France’s Bordeaux, Northern Rhône, and Burgundy regions and so Washington’s adapted cultivars of Vitis vinifera grapes benefit from similar dynamics in the growing cycles of their distant, European ancestors. 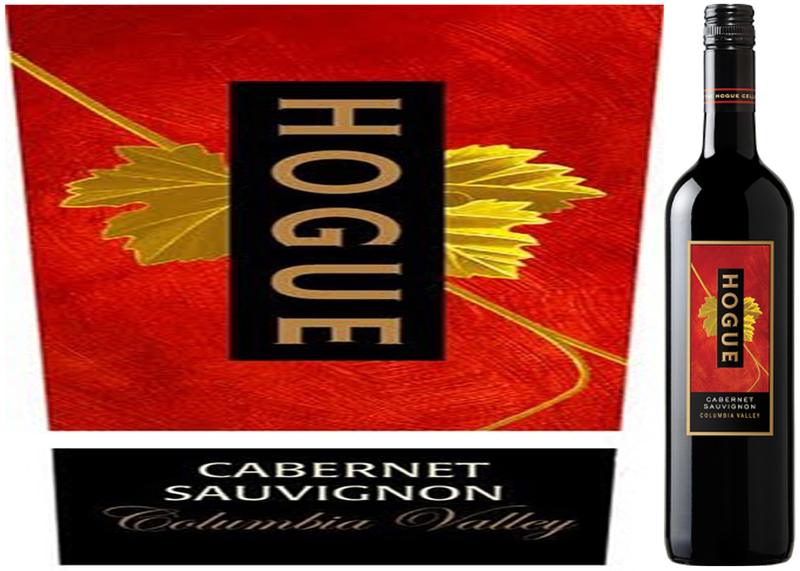 As for this week’s featured wine and vintner, Hogue Cabernet Sauvignon 2014, the defining difference in their various Columbia Valley plots is the prevailing dry climate. Lying in the rain shadow of the Olympic and Cascade Mountain ranges, the hot days promote plumping of the grapes and sugar content, alternating with cool nights that maintain bright acidity levels. As an introductory example of the fruity and fresh wines that these conditions yield, this deft blend of 78% Cabernet Sauvignon, 14% Merlot, 5% Syrah, small splashes of Petit Verdot and Malbec, and cooperative weather during 2014 – all make for a pleasing bottling that defies a $14.95 price tag, and possibly prompting a few of those previously mentioned California vintners to blush with envy! This is an uncomplicated, easy-drinking Bordeaux-style red that exceeds its pedigree and expectation at this price-point. An abundance of cherry, raspberry and plum aromas and flavours are wrapped around the pleasing oak, making it a natural complement to food fare such as roasted pork tenderloin in a Madeira sauce, marinated flank steak with sautéed mushrooms or braised short ribs and polenta with crispy onions. Curiously, in spite of its ancient and storied culture — and being so agriculturally prolific in modern times — Apulia (aka Puglia) remains a less-well-known Italian region. It hasn’t always been so. In antiquity, the Phoenicians and Spartan settlers understood the potential of the land, as well as its strategic importance in straddling the Adriatic and Mediterranean seas. Its attraction wasn’t lost on the Lombard’s, Goths, and Byzantines either, who ruled Apulia during the early Middle Ages. In the 13th-century, Holy Roman Emperor Frederick II of Swabia was so enamoured of its charms that he built a host of Romanesque cathedrals and palaces. 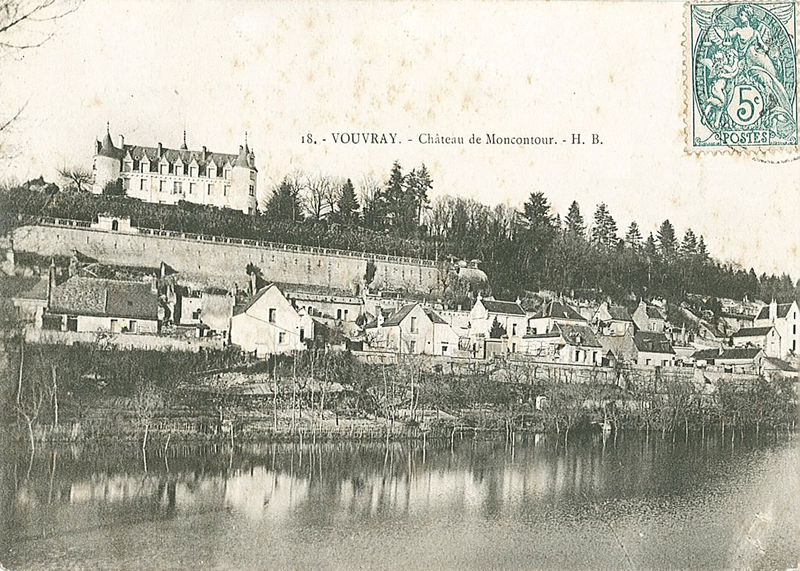 Shortly thereafter, though, a long period of decline and neglect set in; largely due to being distantly governed by the succession of Spanish, Austrian, and French Bourbon rulers. In having become an unprotected land, it was also vulnerable to Saracen raiders who shipped off much of the population into slavery. Surprisingly late in the long path of Apulia’s history, the gradual restoration of stability and prosperity came in 1860 when it was finally re-embraced as a part of the Italian Kingdom; forerunner to the republic that we’re familiar with today. 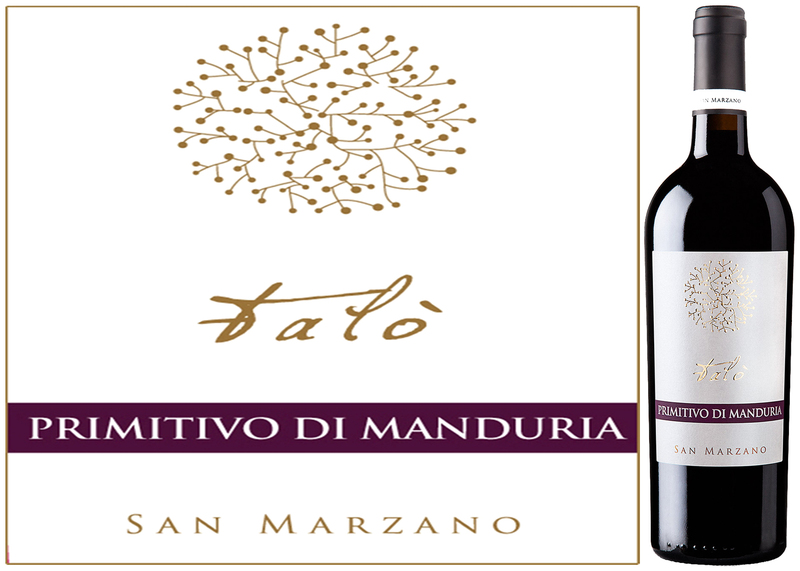 such as Negroamaro, Malvasia Nera, Aglianico, and Primitivo – the star variety in this week’s DéClassé feature, San Marzano Talò Primitivo di Manduria 2013. With a name derived from several Latin terms loosely translating as ‘the first to ripen’, Primitivo has traditionally been used to fortify blended reds. More recently, the variety is increasingly being finished as a varietal wine, prompted in part by the popularity of Zinfandel; a clonal relative that flourishes in Californian vineyards and has had great success in North American markets. Local winemaking lore suggests that the Italian variant (descendent from a Croatian parent grape) was discovered by a 17th-century monk, Filippo Francesco Indellicati, growing as a wild vine in his monastery gardens. 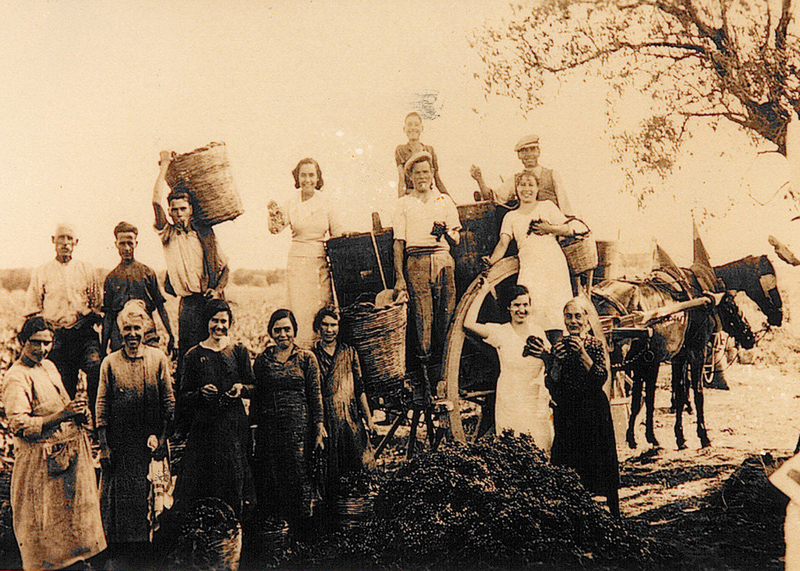 Over time, the adapted cultivars of Primitivo spread throughout Apulia, eventually arriving in Taranto Province 100 years later. Founded in the early 1960’s by less than two dozen winemaking families rooted around the regional center of San Marzano, Cantine San Marzano has grown into a coop with over 1200 members; sharing a commitment to produce quality wine that authentically reflects the region’s indigenous grapes and related finishing styles. The cantine has steadily evolved into one of southeastern Italy’s premier, exporting producers, and this bottling stands as a well-made, mid-level example of what Apulia’s vintners can offer in the 21st century. With the slide into cooler Fall weather, now is an apt time to revisit more robust wine styles such as this Primitivo – ti fa bene (it’s good for you)! This deep ruby red wine has a very fruity palate typical of the grape style with aromas and flavours of raspberry, plum, clove and a restrained touch of sweetness. Try serving alongside some classic autumnal comfort foods such as braised beef brisket or short ribs, hearty ragout, veal scaloppini with fresh pasta or a Neapolitan style pizza. The European Union reclassified wine grading in 2011 to streamline the wide-ranging, comparative designations. In France, this now breaks down as AOP Appellation d’Origine Protégée, a premier classification with a fairly strict set of requirements; IGP Indication Géographique Protégée, the intermediate category with more flexible guidelines and a greater diversity of permitted varieties, and lastly, Vin de France, the most generic designation; allowing for the practice of cuvée — the blending of wine batches sourced from different growing regions. Languedoc-Roussillon is by far the biggest and most prolific IGP zone, whose 2,700 wine producers are tending to approx. 245,000 hectares of vineyard. It also provides the namesake of d’Oc into the classification, likely derived from Lange d’Oc, one of two still actively spoken Provençal languages whose historical and cultural roots lie in the formerly independent kingdom of Aquitaine. Present day boundaries stretch between the Spanish frontier to the west, the Loire to the north, the Rhône region of the Gard to the east, and the Mediterranean Sea. Flourishing in a diverse set of global regions, Chardonnay can be finished in a broad range of styles. 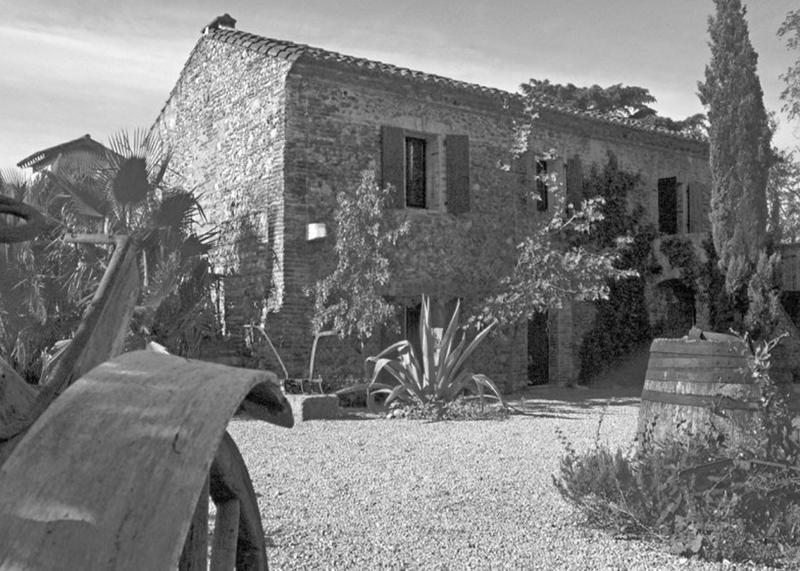 In Languedoc-Roussillon, apart from generally being a hot and dry zone that yields fully mature grapes, the easy-drinking Chardonnay style being produced is decidedly on the lighter and fresh side of the sliding scale. In the 45 years from the comprehensive overhaul that was begun in the early 1970’s, which saw the replacing of unremarkable vine stock with Noble Grape varieties such as Cabernet Sauvignon, Syrah, Merlot, Chardonnay, and Viognier, there has also been a steady commitment to quality development while maintaining prices at competitive and attractive levels. Though it’s edging toward the upper tier of price-point for white wines in this humble corner of southern France, and relative to what one might expect for comparable quality wine in not-so-distant Burgundy — at $17.95, this bottling of Lafage Novellum Chardonnay 2014 is nonetheless fairly priced; outstanding value, and most importantly — delicious! A 70% majority of this wine is aged in stainless steel, while the remainder sees the mild influence of wood; imparted during two months spent in second-use Oak barrels. 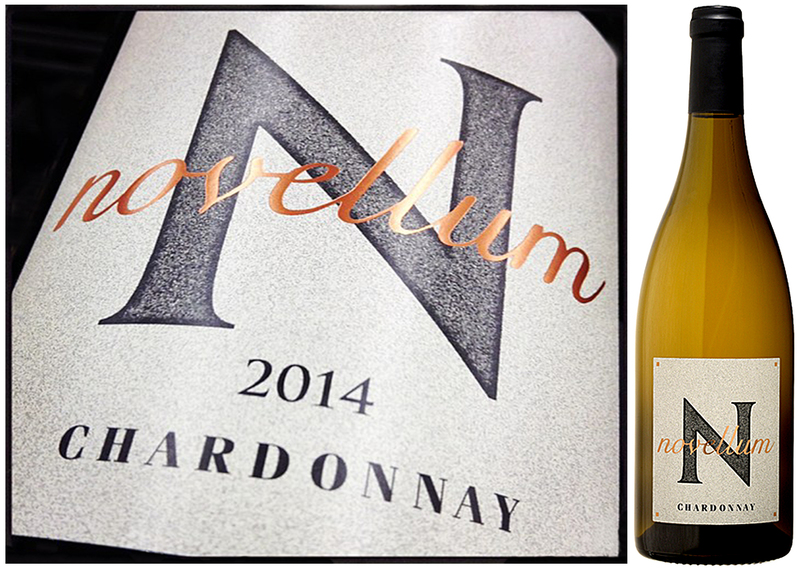 What’s particularly novel in the multi-step finishing of ‘Novellum’ is that it also spends 3 months resting on the ‘lees’ (expired yeast) of a previously fermented batch of Viognier wine, which was filtered out and then transferred to the Chardonnay. It’s another one of the details that set this dynamic vinicultural partnership of Jean-Marc and Eliane Lafage apart from the more conservative, less-innovative, more-expensive wine-making crowd. Dictionaries say that Novellum is a latin adjective meaning: new, young, fresh, etc. I’ll add that it could also mean: will thrill your guests’ palettes alongside Thanksgiving food fare! This medium-bodied white wine is marked by tropical/stone fruit aromas and flavours wrapped around some refreshing acidity and mineral notes. Try serving with roasted goose and a squash risotto, herb-crusted turkey with rosemary/thyme, spiced apple and sausage filled chicken or Cornish hen and stove top sage stuffing. bodegas have a tradition of marketing wines fashioned from intermixed grapes; supplied by approx. 20,000 growers; drawing from harvests throughout Rioja’s three designated sub-regions: Rioja Alta, Rioja Baja, and Rioja Alavesa. More recently, to better typify their individual output, bodegas are becoming selective in sourcing their grapes from single zones only. The underlying point is that the varied terroirs of these sub-regions produce discernibly different versions of so-called Rioja wine; it’s not a uniform styling, but it is a testament to innovation! Here in North-central Spain, hilltop monasteries and other stone fortifications built up over centuries provide ample evidence of a storied land that shares a border with the medieval, Franco/Spanish Kingdom of Navarre. On its side of the modern boundary, Rioja’s cultural identity remains distinct and grounded in a 120km-long geography that straddles both banks of the famed Ebro River. As for the roots of its name, ‘Rio’ (river) was combined with ‘Oja’ (a tributary of the Ebro) to create the recognizable moniker that has achieved a global renown. 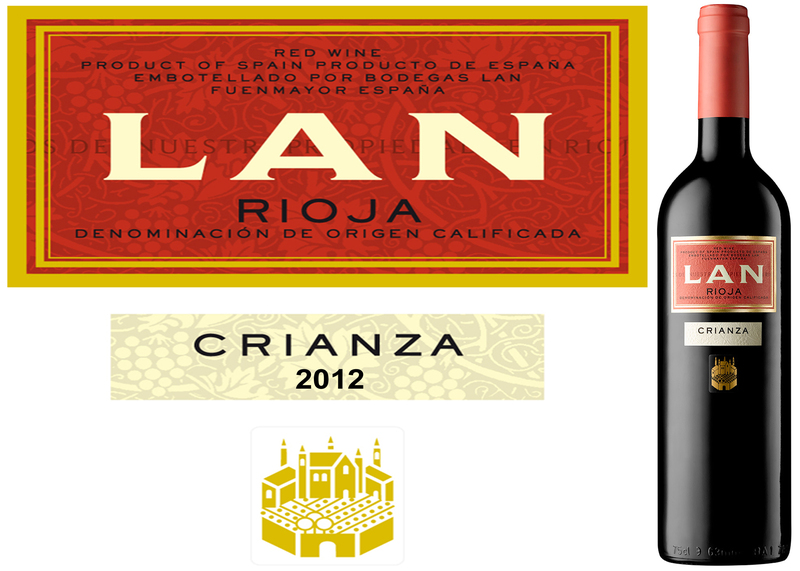 For this week’s DéClassé feature of the Bodegas LAN Crianza 2012, the bodega’s name, LAN, is an acronym reference to the provinces that make up the larger Rioja DOCa (Denominación de Origen Calificada) – Logroño (now called La Rioja), Álava, and Navarra. This winery’s flagship vineyard, Viña Lanciano, is a spectacular 72-Hectare plot that’s framed by a horseshoe-shaped bend of the meandering Ebro River. 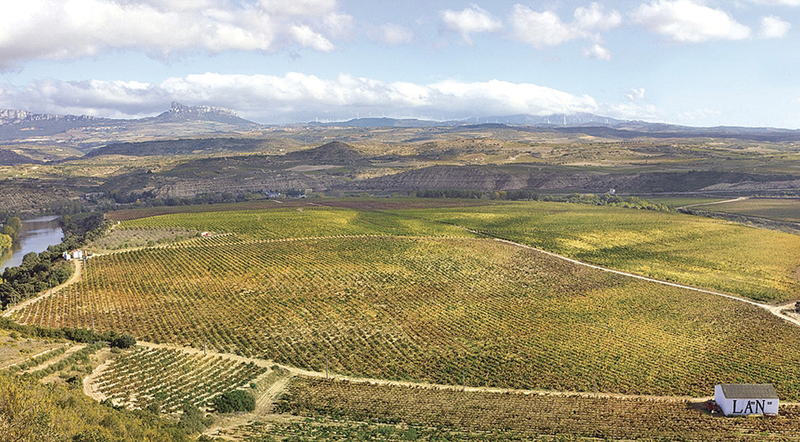 At higher elevation, Rioja Alta has a reputation for producing lighter, fruit-forward wines that result from a shorter growing season coupled with the character of its limestone, sandstone, and alluvial soils. For this entry-level bottling, that’s an accurate description for a blend that combines 95% Tempranillo (Rioja’s indigenous grape) with 5% Mazuelo (Carignan Noir) to boost its tannin, acidity, and colour. The Crianza designation attests to the wine being aged for 14 months in a novel construction of hybrid wooden casks that are made of American Oak staves with French Oak tops. This current offering has also undergone 3 years of cellaring in the bottle; well beyond the 1year mandated for a Crianza grade. 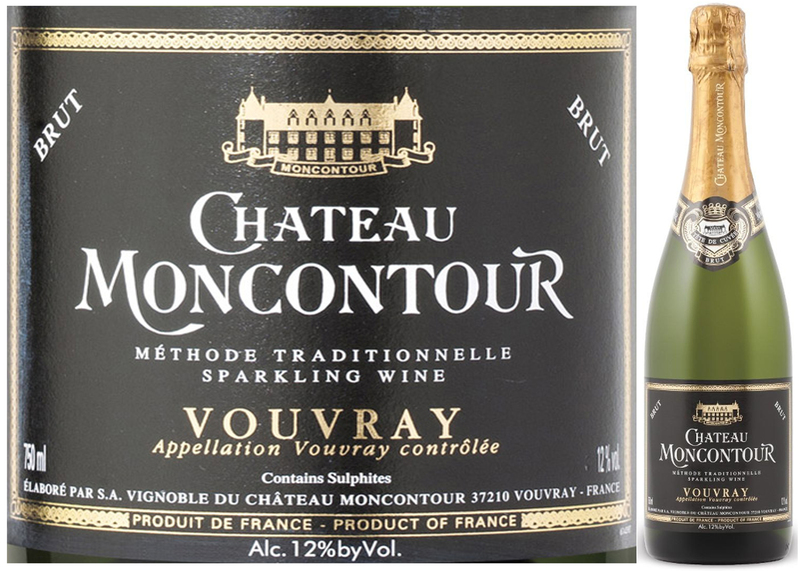 Unlike the perennial DéClassé recommendations of the 2006 – 2009 vintages, the immensely popular 2010 thru 2012 releases were ordered by the LCBO in sufficient amounts to qualify for its ‘Vintages Essentials’ listing; translating into yearlong availability. 2012 was a very good growing year in the Rioja DOCa, and though this example is not the most complex that you might have the chance to savour, it’s well made, balanced and more-than-worth the sale price sticker! With layered aromas of red fruit, vanilla and spice, this medium-bodied and lively red has a smooth balance of light tannins and alcohol. As an apéritif, try pairing it with semi-ripe cheeses and spicy tapas. With main courses, serve alongside an Arugula salad topped with grilled chicken/lemon pepper dressing, brochettes of lamb with roasted beets or herb-crust pork tenderloin wrapped in prosciutto.